We enjoyed this quite a bit. I opted to cook this in my crock pot. 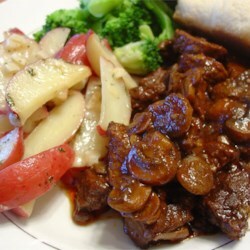 I used beef stew meat, fresh brown mushrooms that I quartered, and roughly chopped onions. I also added a packet of beefy onion soup mix, and since I didn't have any wine I just added some water.